From the pages of Warren Publishing's Eerie magazine, The Rook returns in new archival editions, bringing you the best of the time-traveling swashbuckler. 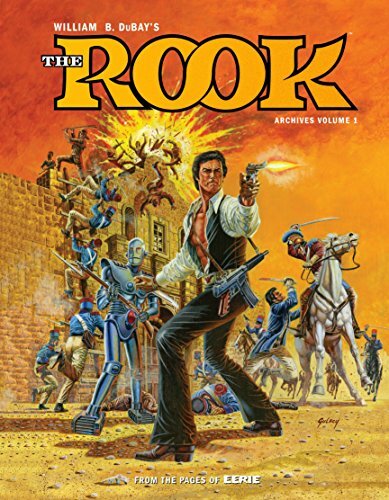 Written by William B. DuBay and drawn by Jim Stenstrum, with covers by Paul Gulacy, The Rook follows scientist and adventurer Restin Dane as he travels through history. Collects The Rook stories that appeared in Eerie Archives Volumes 17 and 18. From the pages of Warren Publishing's Eerie magazine, The Rook returns in new archival editions, bringing you the best of the time-travelling swash-buckler. Written by William B. Dubay and drawn by Jim Stenstrum, with covers by Paul Gulacy, The Rook follows scientist and adventurer Restin Dane as he travels through history righting wrongs and saving those in need, while investigating the mysteries of his own family history. Joined by robots he created, and traveling via his invention The Time Castle, the Rook takes readers on a journey through time they'll never forget. A value-priced, high-quality edition for Eerie and Creepy collectors. Dark Horse has re-launched The Rook with Steven Grant writing and Paul Gulacy providing the art. William Bryan Dubay was an American comic-book editor, writer and artist best known as editor and writer for Warren Publishing, including the company's horror-comics magazines Creepy, Eerie and Vampirella.